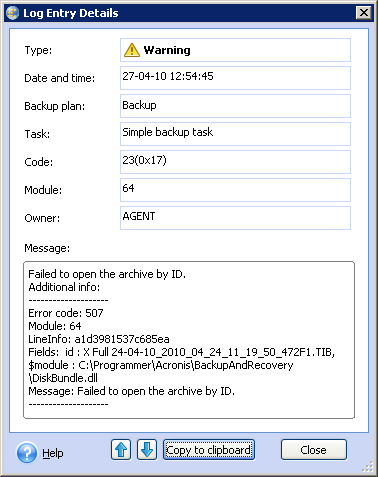 16996: Acronis Backup & Recovery 10 Shows Warning Message in Log "Failed to open the archive by ID"
(!) This article does not apply to other versions of Acronis Backup (Acronis Backup & Recovery)! This is a GUI issue. This message should be logged internally, and not in operation logs. During a backup or other operation with a backup archive Acronis Managed Machine Service parses the contents of the .meta folder in the backup location and compares it with the actual TIB files in the vault. Warning Failed to open archive by ID appears when an inconsistency between the .meta folder and the actualTIB files is found and fixed. This warning can be safely ignored. The backup archive itself is not affected. Again go to Start-Run -> services.msc -> and start Acronis Managed Machine Service.